The side delts are located just on the top of shoulders. These are located just between the posterior and anterior deltoid muscles which help in assisting movements such as external and internal rotations. There are several exercises which help in providing power and flexibility to these side delt muscles. Improving the power and flexibility of these strategic muscles help in conditioning them, improves flexibility and works to tone the muscles. Side delt exercises help in building endurance and stamina, especially in the case of bodybuilders and athletes who need to improve their performance. This is an effective isolation workout which works very effectively in firing up the side delts. Lateral raises can be done with one arm at a time or using both your arms. You need to start the workout, with your arms hanging by your sides. Your palms shall face your body. You will have a dumbbell in your hand. This shall be a start position. Now, slowly raise the hand up and straight from your side till the arm is completely parallel to the floor. Your palm shall face down. You need to wait for a second and then again slowly lower down your weight. Get back to the start position. This shall be one repetition. You need to do 6-8 such repetitions for each leg when you start. 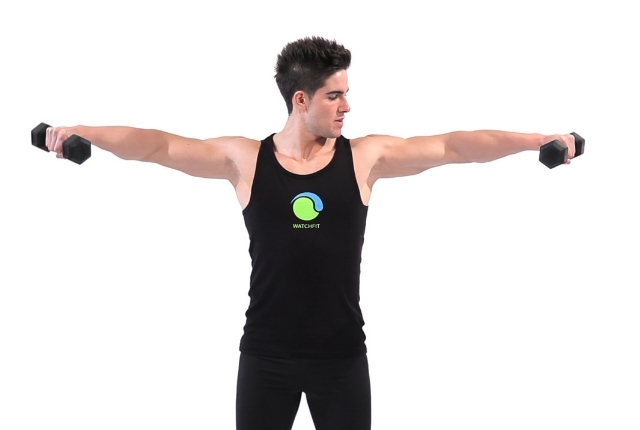 This is about light shoulder rotation, which helps in exercises your side delts effectively. You need to start the workout by sitting on a bench in a comfortable position. You will require a complete vertical back support for this workout. You will also need to hold one 10-20 pound dumbbell in your hand. Now, slowly press the dumbbell and bring it overhead. Your palms shall be facing a bit forward as you are bringing them down. You need to rotate your arms internally. Thus, when your arms are close to the chest level, your palms will be facing the body. You need to keep your elbows tucked in closely and by your sides. You will slowly press the dumbbells back and up externally, as you keep rotating the arms and as the weights move a bit upward. You will be completing the process by keeping the arms extended and your palms in a forward position. This is another very effective workout for your side delts. You need a flat bench for the workout. You will be placing a dumbbell to the long side of the bench. You can lie down on this bench, with a side of the body down. As you work on the right shoulder, the left shoulder shall be on bench. You will quickly grab the dumbbell and then slowly lift it from the floor and up, as you use the hands of your shoulder. You can keep a slight bend by the elbow. Now, gently lift the dumbbell in an arcing motion. You will be inhaling two times in this motion. 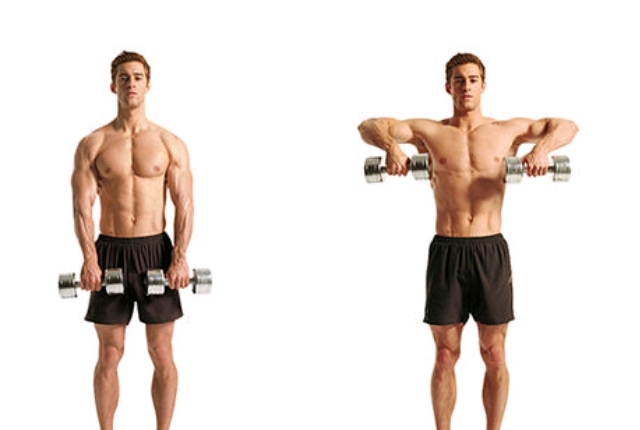 You can slowly lift the dumbbell till the arms are completely perpendicular to the floor. You can again lower this dumbbell back and get to the starting position. You shouldn’t allow the dumbbell hit the ground. Exhale comfortably in this motion. You can again switch your sides and repeat. Start this exercise by holding a barbell with your hands. They should be held at least shoulder distance part. You need to hold the barbell, with your arms straight and down, keeping them just in front of the body. As you keep this bar near your body, you will be slowly bending the arms and lifting the bar. You can let your elbows do the main movement. As you are done, you can complete the routine by keeping the barbell at the height of your shoulder. However, your elbows need to be a bit high than the bar. You can slowly lower this back down. You can also do Upright rows using a Smith Machine which can assist you in lifting a heavier weight, as you are in good control of the bar. This exercise helps in targeting the side delts and helps in building power, strength and stamina. This workout helps in usin the front of the shoulder and the upper back muscles. To do this workout, you will need a workout bench and a dumbbell. To start, lie down on the bench by your side. Your legs shall be stacked. 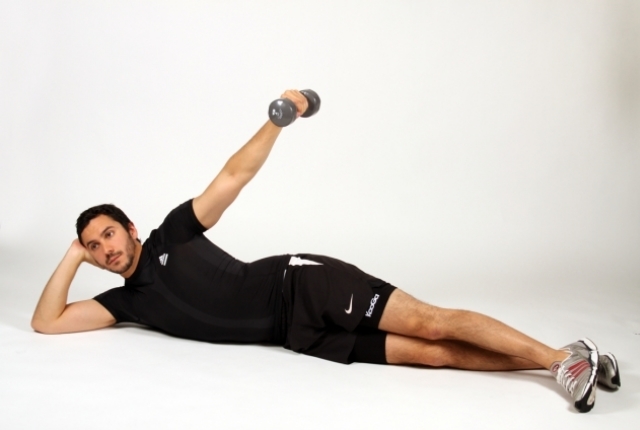 You can use your hand of the top arm and then grab the dumbbell. You can hold it off the floor in this position. From the position you started, as your elbows are a bit bent, you can lift your arm comfortably with an arcing motion, till it is well perpendicular to the floor. As you are on top of the movement, you can stop for a while and get back to the start position once again. You can again change the sides and work with the other arm.